Bridging the Gap was presented today to the Ethiopian authorities, development partners and civil society organisations at an event organized by the Austrian Development Agency (ADA), implementing and co-funding partner of BtG in Ethiopia. The event, kicked-off with a reflection from the country’s disability movement by Kalkidan Shemeles from the Federation of National Associations of Persons with Disabilities (FENAPD), was celebrated in the presence of Adviser to the State Minister, Ministry of Labor and Social Affairs (MoLSA), Abebe Gebremedhin, who expressed his appreciation to the European Union “to support the government effort on advancing inclusion and strengthening organizations on disability inclusion and strengthening organizations of persons with disabilities to enable them to meaningfully participate in development of an inclusive Ethiopia”. In Ethiopia, BtG works to promote disability inclusion on the resilience agenda and in particular in resilience building livelihood interventions and social protection, through existing resilience-building programmes that are being implemented by the government sectors in collaboration with development partners such as CARE, UNDP, OXFAM and local NGOs. This aspect, commonly known as “disability mainstreaming”, was highlighted as “particularly interesting” by the Head of Cooperation of the Embassy of Finland, Arto Valjas, “to achieve a bigger impact than a project of its size would normally achieve”. Organisations of persons with disabilities are key partners to BtG. The project works to strengthen their organizational and technical capacity of selected organisations in the target regions, namely the Amhara and the Somali National Regional States: “We need to provide space for persons with disabilities to be treated as equal citizens, empowered rather than passivated to be part of their communities and contributing to the development of the country”, stressed the Head of Office of the Austrian Embassy’s Development Coordination Office in the country, Astrid Wein. Likewise, the Deputy Head of the European Union (EU) Delegation to Ethiopia, Terhi Lehtinen, highlighted on his welcome remarks the value of this project to address the challenges on the inclusion of persons with disabilities, in line with the Convention on the Rights of Persons with Disabilities (CRPD), the Sustainable Development Goals, and the European Consensus on Development. “I am confident that the project in Ethiopia will provide valuable contribution also to the global approach to promoting inclusive policies and services for all”, he said. The institutional part of the event, moderated by the Ethiopian lawyer and disability rights activist Yetnebersh Nigussie, also included the keynote speech of the International Labour Organization’s Country Director, George Okutho, as well as the presentation of Bridging the Gap by the project Communication Officer, Carmen Serrano, from the International and Ibero-American Foundation for Administration and Public Policies-Spanish Cooperation (FIIAPP) and the Country Coordinator, Pia Korpinen, from the Austrian Development Agency. The session concluded with an inclusive performance offered by Destino Dance Company to raise awareness about disability by focusing on the positive aspects of diversity. The event, attended by nearly 70 persons, was followed by a technical workshop, dedicated to “Including persons with disabilities in Ethiopia” under the moderation of Dagnachew Wakene from the African Disability Alliance, and inputs from Fantahun Melles (International Labour Organization), Shitaye Astawes (ADA-Bridging the gap) and Getachew Berhanu (UNICEF). Bridging the Gap is an EU-funded global initiative that aims to contribute to socio-economic inclusion, equality and non-discrimination of persons with disabilities in low and middle-income countries through more inclusive and accountable institutions and policies. Bridging the Gap in Ethiopia is implemented by the Austrian Development Agency (ADA) in collaboration with Ministry of Labour and Social Affairs (MoLSA). It is funded by the European Union, co-funded by (ADA) and the Government of Finland and coordinated by the International and Ibero-American Foundation for Administration and Public Policies (FIAPP). 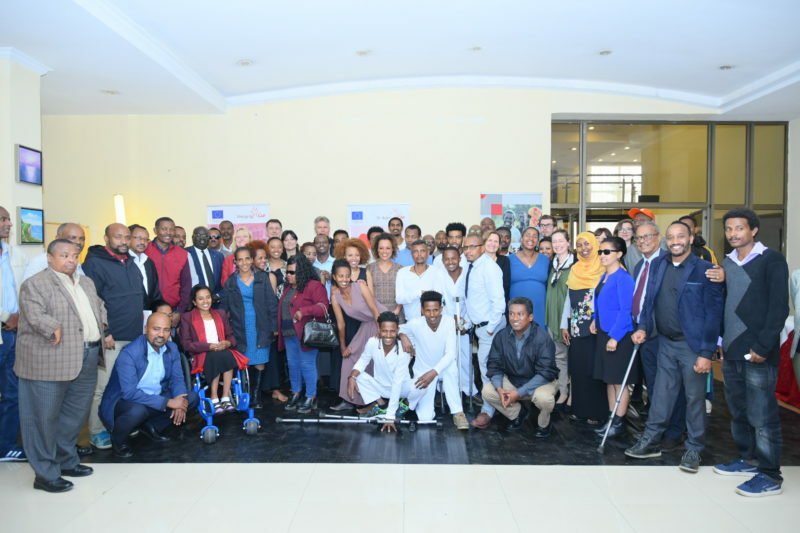 The country action plan for Ethiopia focuses on promoting disability inclusion in the livelihood sector, linking in particular to livelihood interventions that are aiming to improve resilience and those that are part of social protection programmes. The geographical scope of the project is the Amhara and the Somali National Regional States and the Federal level in Ethiopia. A specific emphasis will be put on ensuring inclusion of women with disabilities and young persons with disabilities.